Stream Flow and Temperature Monitoring, Operation and Maintenance, for Clean Water Services (OR) | WEST Consultants, Inc. Since 2008 River Measurement, a division of WEST Consultants, has been contracted to operate and maintain continuous record stream gaging stations for Clean Water Services. In 2008, work began with 28 stream gaging stations and 53 water temperature sites. These stream gaging stations were previously operated by the Oregon Water Resources Department. The number and locations of stream gages has changed from year to year as we continue to select, build and operate new sites, as well as relocate and discontinue others to meet the changing data needs and budget of Clean Water Services. Each gaging station has a data logger with stage and water temperature sensors. 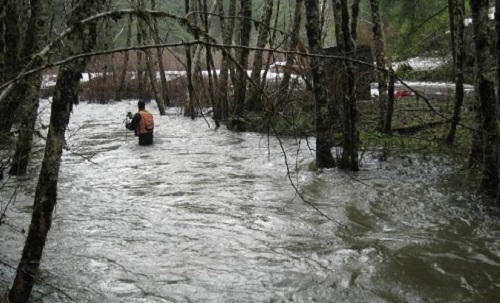 When appropriate, streamflow is measured in pipes with an area velocity meter (ADVM). On one of the problematic larger streams WEST uses a sophisticated ADVM positioned in the channel to compute continuous stream discharge using area-velocity and index-velocity ratings. Another gaging station is operated jointly with the U.S. Geological Survey. River Measurement independently operates and maintains all equipment at the stream gages. We conduct discharge measurements, develop stage-discharge rating curves, perform data analysis, and compute 15-minute values of stage and flow at each station. Hourly, maximum, minimum, and mean daily water temperature is provided. Standard USGS methods and equipment are used to collect and compute data. Recommendations are given for relocation of gaging stations and equipment upgrades at sites that have a history of missing or inaccurate data. Most of the gaging stations are located on small streams where data collection and discharge computations are complicated by factors such as beaver dams and short duration flood peaks. WEST staff meets these challenges by scheduling site visits when needed to address potential problems, through careful planning, and by focused and rapid response to high-water events.